Over 150 years ago, a man was killed with a silver bullet in a rural, Pennsylvanian town. A man who just might be a vampire. The Vampire Club, a group of misfits who meet regularly in the basement of Western Virginia University’s library, think that they might have found their first documented case of a real vampire. Better yet, the Club thinks that the vampire might still be alive to this day, lying comatose in a hidden grave. And this is good news indeed for a group of vampire lovers. The hunt begins, and as they close in on their immortal prize, they soon realize that they aren't the only ones interested in the vampire; indeed, a powerful group of killers will use whatever means possible to keep the vampire permanently in its grave. 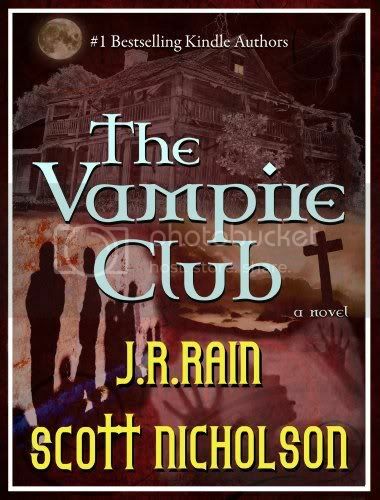 The first in a series that features The Vampire Club, a group of lovable, laughable, larcenous college students turned vampire hunters. I just finished reading this book last night and I must say this is one book I couldn't put down and it was funny. This is a young adult book but I enjoyed it very anyways so if you are into these Young adult vampire novels I highly suggest you get this book because I am pretty sure you will like it as much as I did. thanks for taking the time to share our book with your readers, Chantale!